On 16 July 2015, was a miracle day for Bollywood India, First of all most waited Shah Rukh Khan's Upcoming movie of 2016 Raees Teaser (Official Trailer) Published, Hero Movie's trailer Announced & Yes most beautiful, Past miss world Priyanka Chopra's birthday. Production Company 'Red Chillies Entertainment' published 'Raees' Trailer on Youtube and Twitter with the marketing hashtag #RaeesTeaserTonight. One first hour SRK's Raees's Teaser got 1m views, this count is unbelievable also twitteratti tweeting 19.6K tweets per seconds for the 'Raees Trailer' trend. 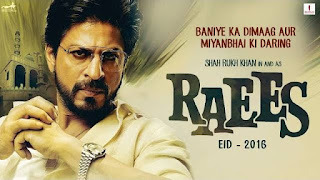 Here is the exclusive Theoretical Teaser & Trailer of the "Raees (2016)" - Which you can download from any Youtube Downloader.